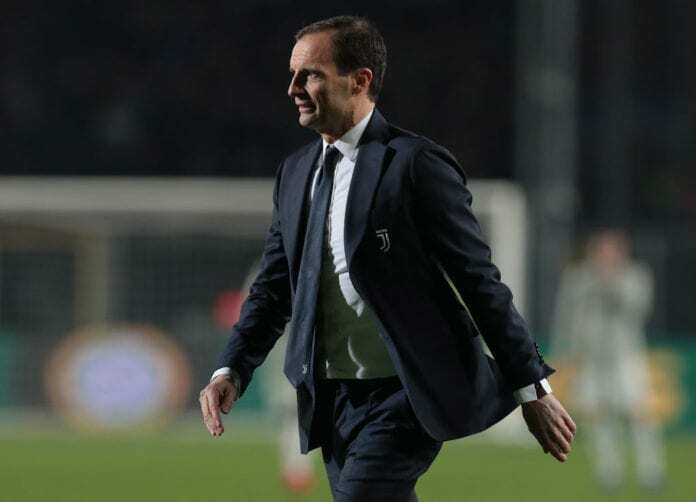 Juventus boss Massimiliano Allegri acknowledged that he deserved to be sent off in their shock 3-0 defeat to Atalanta and gave an update on Giorgio Chiellini’s injury. The Italian was given his marching orders at Bergamo due to his furious exchange with the fourth official following Duvan Zapata’s first goal for Atalanta in the 39th-minute. The Colombian forward found the net twice with team-mate Timothy Castagne grabbing the opening goal to secure Atalanta a shock 3-0 win to eliminate Juventus at the quarter-final stage of the Coppa Italia on Wednesday night. It ended the Bianconeri’s hopes of a fifth successive domestic double and Allegri admitted that they had this coming following last weekend’s struggles at Lazio, which required a late Cristiano Ronaldo penalty to secure three points. “They were right to send me off, as I was losing my temper at the time,” Allegri told Rai Sport. “This result was in the air for a while, frankly. We had players coming back from injuries, others who were out. You can recover one or two games from a negative situation, but you’re going to lose eventually. “It’s nothing to get dramatic about, as it was just an off day. Atalanta fully deserved to go through and had more verve about them. “It’s disappointing for us to go out, but it was mad to think Juventus could’ve won every single match this season. We really gave some goals away tonight. “I don’t see it as any alarm bell to be worried about, because it is impossible to win every game. We wanted to win the Coppa Italia for the fifth time in a row, but Atalanta were very physical and aggressive, so congratulations to them. “I think a lesson like this can be of use to a team. Last season, we drew with Crotone with a real struggle and then fell to Napoli. You rescue one, you rescue two, you’re going to fall eventually. “We were simply out of steam. It can happen after such a long successful run. We’ve got Parma on Saturday and they are really strong on the counter-attack too. A worrying sight for Juventus was when captain Chiellini was forced to withdraw in the first half with an apparent calf injury. But Juventus do now have Martin Caceres, who rejoined them on Wednesday for his third spell at the club on loan. Allegri’s side will next take on Parma on Saturday in Turin for a Serie A match.